Ingo Rademacher did not renew his contract with the show, s his character will be leaving LA. Spoiler alerts, for "The Bold and the Beautiful," reveal that Ingo Rademacher did not renew his contract with the CBS soap. On Thursday his character Thorne Forrester said goodbye to Will and Katie and walked out of their lives. Ridge's younger sibling has not been part of a front-burner storyline since the brothers caused Dollar Bill to fall off of his balcony. Thorne has been back in LA about a year and now will be leaving again. Wyatt is going to tell his father about the problems in Katie's marriage and now his wheels will be turning. The door will now be open for young Will's parents to possibly reunite. Soap Dirt reveals that Ingo Rademacher has chosen not to renew his "B&B" contract and his character will now soon be leaving LA. On Thursday, seemingly out of nowhere, Thorne told Katie that he sees the way she and her former spouse look at each other and believes he should step out of the way. He also mentioned that Dollar Bill had changed and was now being a good father to his son. 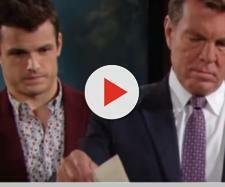 Viewers will remember the reason Ridge's brother married Ms. Logan was to give will a father figure when Bill was trying to get Steffy from Liam. Not long ago, however, Dollar Bill ate dinner with his ex-wife, their son and her new husband. During the meal, young Will said that he wished his family could always be together as they were on this day. Now Thorne is stepping aside to give his stepson his heart's desire. Soap Hub and Soap Dirtindicate that Katie is obviously going to share her marital woes with her former fiancee and that Wyatt will give this information to his dad. "B&B" does not seem to know how to develop the character of Thorne Forrester and keep him around for the long haul like his brother Ridge. Ingo Rademacher is the third actor to play this role in recent years, and now he is departing. Once Katie pours out her heart to Wyatt and he, in turn, shares the details with his dad, it will only be a matter of time before Dollar Bill seeks to reunite his family. Katie will be feeling rejected right now so Dollar Bill will need to take things slow. Young Will, however, will be elated at the prospect of his parents getting back together and giving him the family unit he so desires. Stay tuned to "The Bold and the Beautiful weekday afternoons on CBS at 1:30 PM EST. Be on the lookout for updated spoiler alerts related to this storyline and see if Dollar Bill puts his family back together.